Note: all photos by author unless otherwise stated. Steven Holcomb and his 4-man team, piloting the “Night Train” sled during the second of four runs at the 2012 4-man Bobsled World Championships in Lake Placid, N.Y. Holcomb and the team proceeded to reign victorious in this event, thus further cementing his legacy as the greatest American ever in the sport. Steven Holcomb, the greatest bobsledder in the history of Team USA, died on Saturday, May 6, 2017. He was only 37 years old. Friends found him in his room at the Olympic Training Center in Lake Placid, N.Y. An autopsy, which was conducted the following day, gave preliminary indication that the likely cause of death was pulmonary congestion. He likely died in his sleep. Toxicology reports indicated zero drugs in his system, as well (hear that, Russia?). Needless to say, this sad and sudden news has shocked not only the men’s and women’s bobsled and skeleton teams, but also the sliding sports community around the world and the entire U.S. Olympic community. We have all lost a friend. His achievements, by the numbers alone, are staggering. Three Olympic medals (one gold, two bronze); three world championship gold medals (five counting mixed team events); five other World Championship medals; eight overall World Cup trophies (including four outright overall championships); sixty medals in toto. Since 2009, he was acknowledged as one of the best bobsled drivers in the world. More interestingly, though, he came to the sport from an unlikely background, and overcame a debilitating physical condition that almost ended his career before it took off in earnest. Most bobsled athletes come through the track and field ranks. As long-time bobsled broadcaster John Morgan has often noted, “[Y]ou can teach someone to drive a sled, but you can’t teach speed.” Within the ranks of track and field, decathletes are prized above all others for their ability to both sprint (e.g., the 100 m sprint and the 110 m hurdles) as well as their ability to throw around weight (e.g., discus and shot put events), which are both key skills when pushing a sled that weighs almost 400 pounds. The U.S. and Canada also enjoy another sport from which to recruit that most other countries lack – American football. Ironically, Holcomb followed neither path to the sport he came to love. A native of Park City, Utah, he was first an alpine skier, starting competitive ski races at the tender age of six, and continued to race for the Park City Ski Team for 12 years. In this, he was in good company, as the late, legendary bobsled driver Eugenio Monti of Italy (double-gold medalist at the 1968 Winter Olympics at Grenoble) also was a skier before he took up bobsledding. To be sure, as Holcomb advanced in age, he participated in other local youth sports, such as soccer, football, basketball, baseball, and track and field. So suffice it to say, he was a formidable all-around athlete. In 1998, at age 18, he went to a local try-out for the USA Bobsled team, and scored enough points to where he was invited to stay and train with the national team for an additional week. Though he finished eighth place in pushing competitions, he was passed over for the national team due to his young age and his short stature (he was only 5’-10”, which is roughly my own height!). An injury on the team later that year led him to be invited back onto the team, where his involvement steadily grew. He participated as a push athlete for four years, and served as a forerunner for the Olympic events at Park City in 2002. By 2006, his seven-year stint as a combat engineer in the Utah National Guard had concluded with an honorable discharge, and he then committed himself to the sport full-time. Not a moment too soon, either. The men’s bobsled team was shut out of the medals in the 2006 Winter Olympics. In fact, Holcomb, who piloted the USA-2 team sled, finished sixth in the 4-man event, ahead of Todd Hays in the USA-1 sled. The overall showing was very disappointing, considering that both Hays’ and Brian Shimer’s sled teams won silver and bronze, respectively, in the 4-man at Salt Lake in 2002, thus ending a 46-year medal drought in the sport for Team USA. The showing in 2006 was thus a major let-down. Hays retired from the sport after the ’06 Winter Games, thus passing the torch to Holcomb, known as “Holcy” (holl-key) to his friends. His full-time devotion to the sport paid off quickly. At the conclusion of the 2006-2007 World Cup season, he won the 2007 Two-Man World Cup title, the 2007 Combined World Cup title, and finished second in the World Cup standings in the 4-man. Suffice it to say, the U.S. men’s team had found its leader to take them to the proverbial promised land. But just when Holcomb’s career in the sport was about to blossom, it almost ended. He suffered from a degenerative corneal disease called keratoconus. Basically, he was slowly going blind, and obviously did not want anybody to know. Ironically, this condition gave him a competitive advantage, up to a point. His eyesight continuing to decline, he learned to navigate the narrow, icy tracks of the sport more by feel and increasingly less by sight. But if one went totally blind, not even one’s exceptional ability to feel would be enough to compensate. As his sight got ever worse, he feared he would be forced to retire, but he still kept it a secret from the team. Disgusted with his self-deception and depressed with the prospect of his career in bobsled soon ending, he felt like ending it all. Then, in a Colorado Springs hotel room, after an evening of schmoozing with Olympic team donors, he almost did. That night, he shoved 73 sleeping pills into his mouth – yes, he counted – and downed them all with the rest of a fifth of whiskey he had been drinking. He gradually went to sleep, hoping never to wake up, not even leaving so much as a note. Miraculously, the next morning, he woke up anyhow. Holcy was the first to acknowledge this miracle, and instantly got the message that he had been given a second chance. He started by coming clean with everyone about this keratoconus, telling the story about his battle with the disease, raising awareness of it in so doing. Then, the following year, opthamologist Brian Boxer Wachler corrected his condition with a revolutionary, new treatment that did not even involve surgery. His eyesight restored, Holcomb’s success on the frozen track continued. By the 2008-2009 season, things really came together. For one, the USA-1 team of Holcomb, pushers Justin Olsen, Steve Mesler, and Curt Tomasevicz truly gelled. For another, they used the season to gradually break in a brand-new sled that the BoDyn program had designed and built for them, a sled that quickly became the envy of the top national teams everywhere. With its intimidating flat black primer coating, the guys of USA-1 dubbed it the “Night Train,” and with it, they won the FIBT 4-man World Championship, the first time an American team accomplished that feat in literally 50 years (1959). Sharp continued: “Holcomb is the reason why the USA team coaches do not keep switching around teams. He saw the German and Swiss teams being left alone to find their own mechanics and thus their speed. He brought that philosophy over to Team USA.” According to Sharp, if a change then needed to be made, they would switch out one pusher and then test the new combination over a number of races to ascertain the effectiveness of the move. The fact that the coaches listened and enacted this recommendation has shown with the improved start times, of which the late, storied driver was also a part. It was shortly after Holcomb and his team were world champs for the first time (2009) that I first met Steve Holcomb online via Facebook. Doug Sharp was a fellow Purdue grad, and he and I met while we were both working in the Louisville (Ky.) area about 2006. He told me about Holcomb at that time, about how the proverbial torch had already been passed to him from Todd Hays, and that great days were ahead for the team. My friend Doug had done his part in bringing the program back to prominence, as he was a pusher for Brian Shimer’s USA-2 team that won that bronze at Salt Lake in ’02. He and Holcy had been teammates who had pushed together often in the same sleds and were usually roommates during the World Cup tour while their careers overlapped. They developed a strong friendship in the process. It was at this time that I first met Steve Holcomb online via Facebook. His former teammate, Doug Sharp was a fellow Purdue grad, and he and I met while we were both working in the Louisville (Ky.) area around 2006. He told me about Holcomb at that time, about how the proverbial torch had already been passed to him from Todd Hays, and that great days were ahead for the team. My friend Doug had done his part in bringing the program back to prominence, as he was a pusher for Brian Shimer’s USA-2 team that won that bronze at Salt Lake in ’02. He and Holcy had been teammates, and were even roommates during the World Cup tour while their careers overlapped. They developed a strong friendship in the process. By the Spring of ’09, I had gathered the courage to reach out to Steve via Facebook, and he quickly responded to my outreach by stating “[A]nyone who’s a friend of Doug’s is a friend of mine!” Such was the graciousness of Holcomb that he would quickly accept the friendship of a fan he had never met. In any case, the 2009 World Championship was only a warm-up act. Not even a drunk driving arrest later in ‘09 could halt his and his teammates’ training focus for what was to come. The following year, at the Winter Games in Vancouver (specifically the sliding track at Whistler), Holcy and Team Night Train won Gold in the 4-man, ending a 62-year drought at the top of the podium for that event. Team USA was back as a forced with which to be reckoned in the sport of bobsled. Whosever gold medal it was, it made him a Winter Olympics star. In the months following the huge win, he met with Barack Obama; he golfed with Charles Barkley; he even hung out with Tom Cruise and Katie Holmes, who, yes, were still a couple then. He threw out a ceremonial pitch at a Cleveland Indians game, visited the New York Stock Exchange, and attended the 2010 Indianapolis 500 (not surprisingly, he was a huge racing fan). Also in the wake of winning Olympic gold, he published an autobiography: “But Now I See: My Journey from Blindness to Olympic Glory”. It was in this book that he first confessed to the world about his suicide attempt in Colorado Springs that blessedly failed. He used the story as a way to help others who might have been contemplating something similar, to show them that there are always better solutions. Though he was a focused, humble, grinder, he was always cheerful. Bobsledding is a fraternity. The men and women who compete from different countries may always try to out-race each other on the track, but there remains a respect for everybody – to varying degrees – throughout the International Federation of Bobsleigh and Skeleton. Competitors throughout the world admired Holcomb for the aforementioned qualities he possessed. He even came up with the “Holcy dance” around 2009, a less-than-rhythmic shuffle that he did at each race of the World Cup circuit to make fellow competitors laugh and to keep everyone loose while competing. After having reached the pinnacle of success in his sport at the 2010 Winter Games, it was only natural to anticipate a slump in performance, a let-down. But despite his drunk driving arrest in ’09 (the judge sentenced him to 180 hours of community service), a gold medal at the 2010 Winter Olympics, and the publicity and endorsements that came with it, even with teammate Steve Mesler retiring after said Olympics, Holcy and Team Night Train continued to maintain their diligent efforts and forge ahead. 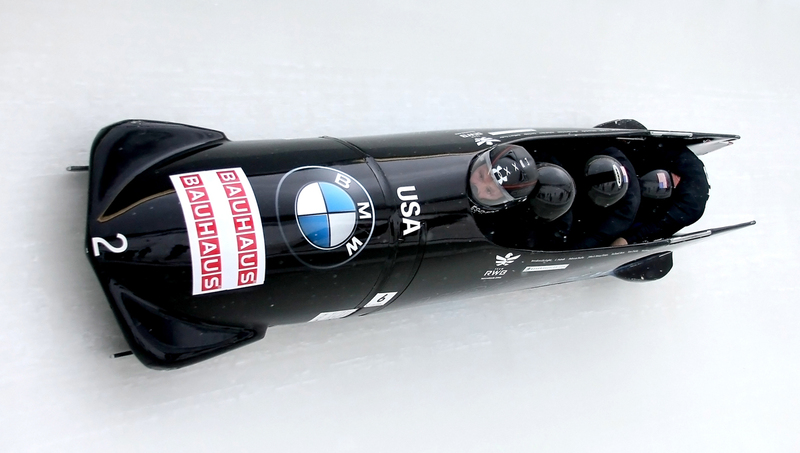 They even won bronze at the FIBT 2011 World Championships at the Koenigssee track in southern Germany. It did not hurt that Steve Langton replaced pusher Steve Mesler upon the latter’s retirement. Langton worked his way up the team ranks and soon pushed for the USA-2 sled. By the time he joined Team Night Train, he was considered one of the best push athletes in the world. As well as Holcomb’s performance continued to be for the 2010-2011 season, he still maintained focus and diligence, as he felt there were still key things yet to achieve. For one, the United States had never won a world championship in the 2-man event, and he was still out to prove that he could continue to win in the 4-man. No doubt these were some of the biggest motivating factors as he and the rest of Team Night Train tackled the 2011-2012 season, which culminated in the world championships at a home track, Lake Placid. As a long-time fan, I saw this serendipitous occasion as my opportunity to travel up there to watch (and photograph) Holcy and the boys in action. It helped a ton that my friend, Doug Sharp, joined me up there and provided me with insider access that I shall forever treasure. The weekend prior to my arrival in Lake Placid – home of both the 1932 and 1980 Winter Olympics – the 2-man world championship had already taken place, and Holcomb, along with brakeman Steve Langton, had already made history with the U.S.’s first-ever world championship in that event. But now it was Feb. 25, 2012; time for the 4-man event, the marquee event of all sliding sports. Holcomb and the rest of the USA-1 team finished the first of four runs in second to Germany-1, but put themselves in the lead after the second run. As incredibly eventful as the day was, it was far from over after those two runs. Doug Sharp took the opportunity to visit with his friend and former teammate, and brought me along over to the Olympic Training Center for this blessed opportunity. There, in a small, garage-like building at the complex, the two of us entered, and there they were. Despite having two strong runs earlier that day, there was no time to be complacent, as three of the four guys were there, Holcomb included, polishing their sleds’ runners as part of preparations for tomorrow morning’s final two runs. Naturally, I wasted little time introducing myself in person to Holcy and to everyone else, thanking them for honoring our great nation. To my amazement, Holcomb actually remembered me from Facebook! The gratitude I offered to these fine fellows was very well-received, too. Bobsledding is obviously a niche sport, one that does not attract the massive fan following of NFL or college (American) football, of the NBA, of Major League Baseball, or top-tier professional soccer in Europe and South America, for that matter. As such, these fellows treasure the relatively few fans they have, and it shows. On the evening of Feb. 25, 2012, two old friends caught up on things. Holcomb, ever the grinder, was visiting with his friend and former teammate, Doug Sharp, while he is polishing one of his sled’s runners for the last two runs of the 2012 4-man World Championship the next morning. What immediately struck me about Steve Holcomb when I was able to converse with him was how humble he was in his achievements. Here he was, the most decorated American bobsledder of all time, whose achievements have been without parallel despite a long tradition of American success during earlier eras of the sport. Yet he acted as if they were no big deal: what mattered was what he achieved lately, as he kept his nose to the grindstone, maintaining an unshakably calm demeanor all the while. The following morning, Holcomb and Team Night Train picked up where they left off, and maintained their lead through runs 3 and four, winning the world championship in the 4-man event convincingly. Naturally, many a set of congratulations and ‘atta boys showered upon the team. Holcomb was on top of the world for his sport, having won the world championship for both the 2-man AND 4-man (again, an unprecedented feat in the history of American bobsledding). Indeed, he had just won his third gold medal/world championship in the 4-man in a span of only four seasons. Yet through all the victory celebration and awards ceremonies immediately following the race, what amazed me was Holcomb’s persistently even keel and humility. Here was a consummate “grinder,” an incredibly focused, diligent person, refusing to let this success or previous successes go to his head. Naturally, his easy-going demeanor, his understated happiness, and approachability persisted as well. Holcomb, flanked by the author and our mutual friend, Doug Sharp, as he hoists the Martineau Cup, the trophy his team won upon winning the 2012 4-man World Championship. Even in victory, Holcomb remained as humble, gracious, and approachable as ever. Even with this latest pinnacle of achievement, he and his team remained as diligent as ever. There was always still some other new feat to achieve, some mountain left unclimbed. A medal at World Cup races at the legendary St. Moritz track in Switzerland (the only natural ice track left on the circuit) continued to elude him, despite his record of success elsewhere. It just so happened that the World Championships were to be held at this Mecca of a track in 2013. Friends, both brand-new and old, together for a group shot during a VIP luncheon in celebration of Holcomb and Team Night Train winning the 2012 4-man World Championship. L-R: Frank Briglia, the engineer who designed the cowling for the Night Train sled; Brian Shimer, the coach of the team and driver for the Bronze-winning USA-2 4-man team from the 2002 Winter Olympics; the author; Steven Holcomb; Doug Sharp and Mike Kohn, who together with Shimer won Bronze in 2002. The legendary “Night Train” 4-man sled, with which Steven Holcomb and his team won both the 2009 and 2012 World Championships, Bronze in the 2011 World Championship, and Gold at the 2010 Winter Olympics at Vancouver. That medal continued to elude Holcomb in the 2-man event of the 2013 “Worlds”, putting even more pressure on him in the 4-man event. But this time, he and Team Night Train came through, winning Bronze. Another mountain was finally climbed, this one far more personal than previous feats. The 4-man USA-1 team remained intact since the 2010-’11 season. What changed following the 2012 world championship were two things. One was that Christopher Fogt eventually replaced Justin Olsen in the line-up. The second was a new sled, also provided by the BoDyn project. Naturally, the team immediately dubbed it “Night Train II”. Whereas the previous sled was built to take advantage of the unparalleled speeds on the Whistler track for the 2010 Winter Games, this one had different aerodynamic qualities built to better-negotiate more complicated tracks, such as the one at Sochi. Whereas the Whistler track remains the fastest sliding sports track on the planet (top 4-man speeds have been known to reach 95 mph), the Sochi track was one of the slowest. 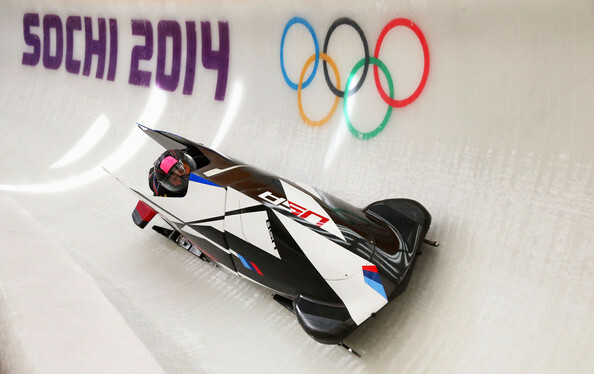 The Sanki Sliding Center was the track for the 2014 Sochi Winter Olympics. Its first world cup race was held following the 2013 worlds at St. Moritz to cap off the 2012-’13 season. Like Lake Placid, it too was a “driver’s track,” but complicated in a very different way. Teams were lucky to reach 80 mph. Those “in the know” pointed out that you didn’t make any time at all on this track. You just tried your best to minimize the time lost. Holcy and the boys did not even place in the first 2-man and 4-man race at the Sanki Center. They obviously had their work cut out for them come the 2014 Winter Games. In other words, there was yet another mountain yet to climb, all the more incentive to keep grinding away as always. This time, he and Steve Langton had a new weapon at their disposal. BMW took over the design of the 2-man sleds, and unveiled a new prototype by 2013. Some tests and tweaks throughout that year ensured that it and other 2-man models were ready for Team USA – both for men’s and women’s events – for the 2013-2014 Olympic season. By the time the Winter Games at Sochi rolled around, Holcy and the boys were ready to go. One achievement that eluded him and Team USA was medaling in the 2-man event. The United States had not done so since 1952. This time, Steve Holcomb rose to the occasion and won bronze in that event. Amazingly, the two came back from 5th place starting the 3rd run and made up the deficit in the last two runs to medal. In so doing, he and Steve Langton quenched another 62-year medal drought for USA bobsledding. More amazingly, he achieved this playing through pain. He strained a calf muscle during the second run of the 2-man, which slightly hobbled his push-runs at the top of the track, and possibly compromised the team’s start times on a track where that was more crucial than most. Yet he pulled off the double-bronze anyhow. Obviously, bobsledding was what he did well above all else, which is why he stuck with the sport after the rest of the 2013-’14 iteration of Team Night Train retired, and Justin Olsen would eventually go on to start piloting a sled of his own. Still recovering from his lower-leg injury during the 2014-’15 season, and leading an all-rookie team of pushers, the team’s performance understandably suffered, and continued to do so the following season as Holcomb’s full strength gradually returned while the team struggled to find its inner rhythm. But Holcomb’s leadership through persistent diligence started to pay off once more, as the team did find its inner rhythm just as the storied pilot returned to full strength. The 2016-’17 World Cup season ended with Holcomb finishing third in both the 4-man standings and in the combined 2-man and 4-man standings. Obviously, Team USA was making a comeback. Clearly, Holcomb was expected to lead the U.S. men’s bobsled team to and through the 2018 Winter Olympics at PyeongChang. But now, all of a sudden, not anymore. In the wake of the shock, eulogies have poured in within Olympic circles throughout the United States. “USA Bobsled and Skeleton is a family and right now we are trying to come to grips with the loss of our teammate, our brother and our friend,” U.S. Bobsled and Skeleton Federation CEO Darrin Steele said. No surviving friend or family member could ever disagree. Yes, he made the occasional mistake, but we all do from time to time in our lives. Moreover, they must never obfuscate the importance of the man, or how he touched so many lives so positively. He was not only the greatest American bobsledder of all time, but he was an unabashed patriot as well; a humble, cheerful, ever-diligent teammate, and an example for all to follow. In short, he was not only a great (nay, superb) American athlete, but more importantly, a great American. As shocked and saddened as we all are at this most sudden passing of a friend, exemplar Olympian, and fellow patriot, we must always be grateful to the Lord our God that he was here on Earth to apply his talents in such a unique way. With his gold medals, we shared great joy in the honor he brought to our country. As a person, we shall always remember the gold in his heart. On behalf of a grateful nation, thank you, my friend, and rest in peace. Amicus noster nobis reliquit multam nimis cito mane et mortua est in vita. Sed perpetua laus Deo sumus qui sciebant eum esse beati atque in perpetuum sui memoriam. Posted by intellectualgridiron in Politics. There is an old saying that Brazil is the nation of the future, and it will always be. Despite the myriads of problems posed by hosting the Olympic Games in Rio de Janeiro, I am still looking forward to the commencement of said Games. But, the reservations cannot go ignored, and indeed, I have chronicled most of them in a recent article. –The corruption in turn has led to the impeachment of its current president, Dilma Rousseff. Her predecessor, Luiz Lula da Silva, is also charged with corruption. All this in turn has led to a political crisis just when Brazil would desperately want to put its best foot forward, so to speak, as the world descends upon Rio for the Olympics. Instead, the country itself is descending into chaos. But at the heart of the majority of these problems is the economic turmoil. Brazil is in its worst economy since the 1930s. No, really. For a while, it seemed as though Brazil’s economy was becoming increasingly robust, so much so that it was about to join the grownups’ table of world affairs. The acronym “BRIC” (Brazil, Russia, India, and China) became a trendy term to use in economic and geopolitical contexts. Brazil certainly took advantage of a strongly emerging economy to the utmost, and played on that image to help persuade the International Olympic Committee to grant them the coveted hosting of the Summer Olympic Games for 2016. Surely the IOC was more than willing to be persuaded, as political correctness no doubt took hold of the organization, and they were more than receptive to the PC siren’s song that it was South America’s turn to finally host the Games instead of proven successful locales in Europe, North America, Australia, or even east Asia. Then the economic downturn took place in the several years that followed. The key question becomes, why? The short answer: Socialism. This defective ideology/macroeconomic policy, a watered-down version of its monstrous brother Communism, has proven to wreck economies worldwide. One need only see Brazil’s neighbor to the north, Venezuela, to see how Socialism has brought that country to absolute ruin. Keep in mind that Venezuela was, for a long time, one of the wealthiest countries on the South American continent what with its robust oil industry. Not anymore. After the notorious dictator Hugo Chavez forced socialism on his country, he stifled the people’s incentive to be productive. When that happens, the every-day exchanges that keep an economy running become stifled as a result. It does not take a rocket scientist to figure out that when the incentive to be productive is taken away and business exchanges continue to dwindle to nothing, eventually real-world shortages ensue, such as the chronically empty shelves in grocery stores all over that country, and the general chaos that follows as a result of that. Lest you think that the Venezuelan government has come to its senses, instead of allowing people to keep more of their hard-earned money and to free up regulation for free commercial exchange, its solution is to this chaos is to enslave its citizens (a Draconian way of doubling down on its failed leftist policies). Did Brazil learn from the mistakes of its neighbor to its north? Apparently not. It’s “Worker’s Party” (any political party with the word “worker” attached to it is going to be very hard-Left) has been in power since 2003. Like other socialist counties, the Brazilian government owns a large percentage of the means of economic production, including the oil company Petrobas, part of the major political scandal embroiling that country right now. Which begs the question: why does the Brazilian government need to own such a large company in the first place? Here in America, ExxonMobil and Chevron are privately owned, and are producing petroleum products quite well. Grousing about gas prices usually makes companies like these the undue scapegoats, but that only exposes the ignorance of the complainers. When gas prices spike, it is largely due to crude oil prices spiking on the commodities market. The other major reason is constricting the supply on the refining end due to government over-regulation. But more on that at a different time. What led Brazil to its current economic collapse was the socialist party in power spending too much money on too many things. It did not happen immediately. Indeed, for a while, the Workers Party was popular because the economy was on the rise due to the commodities supercycle. Because commodities prices were spiking for a long period of time, there was lots of extra cash to engage in vote-buying via cash transfers. Yes, the current crop of crook politicos in Brazil came to power by basically promising voters free stuff, paid for by taking money from people who already earned theirs. Then, the commodities prices fell, and there was no more cash to throw around. In other words, to give a nod to the late Margaret Thatcher, the Brazilian government ran out of other people’s money. Governments with spending problems always do. So what is the solution to Brazil’s systemic economic problem? Start by privatizing Petrobas and other state-owned companies. Governments are horribly inefficient when it comes to managing the means of economic production. Part of the reason is that normal market forces that incentivize both efficiency and effectiveness for firms in the private sector do not apply in the public sector. For example, when was the last time you saw the U.S. Postal Service turn a profit? Indeed, the Olympics themselves are part of the problem, in this case. What do Athens, Beijing, and Rio all have in common? They all hurt their local economies by excessive, wasteful government spending on sports venues that have turned into, at least in the case of the first two cities, abandoned money pits instead of profitable enterprises. Even Beijing’s famous “Birdsnest” stadium has deteriorated some from its 2008 glory. When American cities host the Games, they rely much more heavily on private corporate sponsorship, and the cities’ economies were actually given a temporary boost in the process (see: Ueberroth, Peter, and Romney, Mitt). Even if a government-owned corporation like Petrobas in Brazil is profitable, that can lead to other problems. One, it can conceal possible government mismanagement, at least temporarily. But more importantly, the revenue from that corporation seduces politicians with too powerful a temptation to spend that money, thus begetting further corruption. Rampant spending, after all, encourages what economists describe as “rent-seeking behavior” from otherwise private citizens. Let us not forget that these exact same failed policies of government taking over whole industries is exactly what the so-called “Bernie bros” and their demented, septuagenarian Dear Leader in Vermont currently champion. But as we have seen in South America and elsewhere in the world, these policies only lead to ruin and government-induced suffering. The best way to stem corruption in government is to curtail its spending, and one can do that by restricting its means for revenue. Privatizing Petrobas would be an important start. Given that there is some important degree of democracy in Brazil, one can hope that these market reforms will be able to eventually take hold so as to avoid the mistakes and further catastrophes that we are witnessing in its next-door neighbor, Venezuela. If Brazil’s government fails to implement such reforms, however, then their current crises, both political and economic, are but a prelude of worse things to come. One example of the ruins of the Olympic venues in Athens from the 2004 Summer Games. This is what happens when the hosting of the Olympics are awarded to countries that are not First World/commerce-oriented. The train wreck in Rio de Janeiro that continues to unfold as the Summer Olympics are but days away has exposed two large, systemic problems. The obvious one is with Brazil itself. Its economy may have been on the rise in 2009 to the point where it gave enough people the impression that it was becoming part of the developed world. Not long afterwards, political corruption, lack of infrastructure, and a glaring lack of sanitation exposed Brazil as still being Third World and still having a long way to go before it deserves to sit at the grownups table of world affairs (along with the United States, Great Britain, Germany, Japan, Canada, Israel, Australia, possibly France, and the like). The other systemic issue at play is with the Olympic Games themselves. Simply put, they are huge, and very expensive to stage. Even 40 years ago, things almost reached a tipping point. The city of Montreal hosted the 1976 Summer Olympics, only to be $1.5 Billion in debt afterwards. It took that city almost 30 years to pay it off. Indeed, few cities wanted to host the Games after that. Sure, Moscow jumped at the chance four years later, because to a Communist nation, money is no object when it comes to propaganda. Peter Ueberroth and the Los Angeles organizing committee for 1984 revolutionized how the Games were financed when he persuaded the International Olympic Committee to allow corporate sponsorship. It saved the Games for another 30 years. Now, the Games have grown even bigger still, to the point where they are too expensive for new cities to host the Games. Sure, Putin and the Russian government seemed more than willing to turn Sochi into a $51 Billion (with a ‘B’) boondoggle, because, again, at what price propaganda? Beijing was the only viable city that wanted to host the Winter Olympics for 2022. The IOC was certainly were not going to give the Winter Games to Kazakhstan, for goodness sake. It is a sad commentary on the susceptibility of the IOC to a bribe that so few viable countries and cities thereof even put in bids for the 2022 Winter Games in the first place. That aside, one thing is for certain: the Olympics are so huge and such a big deal that only commerce-oriented (read: First World, developed) countries are built and, indeed, fit to host the Games. Yet, there is this politically-correct mantra out there, saying that everyone deserves a chance, but grownups will tell you that is pure poppycock. The truth is, most nations and even whole continents are not built to handle and host the Olympics. That includes Africa (with the possible exception of Johannesburg), South America (as we are currently seeing now), the Middle East (outside of Israel), and central and Southeast Asia. Even some countries in otherwise developed regions are more than suspect. Remember Athens in 2004? The Greeks built all those state-of-the-art facilities only to let them go to ruin a decade later. Yes, it sounded wonderful for the Olympics to be hosted in the ancient birthplace of the Games themselves, but the huge problem was that Greece is anything but commerce-oriented, which speaks to a culturally systemic problem in Greece itself. One aspect of this systemic issue is that a city that wants to host the Games for the first time has to spend billions of dollars to build new facilities from scratch. In this day and age, even with corporate sponsorship and in some cases, state-supported funding, that is no longer economically viable. 1.) Be situated in a commerce-oriented country (i.e., one of the aforementioned “grownup” countries). Not all cultures are equal. Some cultures are superior to others. A hallmark of this cultural supremacy is a culture that itself is commerce-oriented, that respects the rule of law and property rights of the individual, that frowns on black markets, and puts a premium on democratic governments and transparency within. Not to mention, superior cultures minimize corruption in government, at least compared to more corrupt Third World nations. These sorts of countries also have free presses (to varying extents; France is suspect in this regard) that can call wayward politicians into account for any malfeasance. Commerce-oriented countries also have the necessary infrastructure for such massive undertakings as the Games. This includes transportation (e.g., airports and expressways), not to mention a sufficient amount of clean, comfortable, available hotel rooms to handle the crush of spectators attending said Games. 2.) Be a city big enough that it already has the aforementioned infrastructure in place. This applies to cities that have never hosted a previous Olympics. 3.) This is the big one: ideally, be a city that has already hosted the Games, and has proven to do so exceptionally well. Indeed, for the Olympics to remain doable in the future, the way to go is to starting cycling them around to cities (and, by extension, their countries) that have proven capable of hosting the Olympics well. The IOC seems to be inching towards this already, however gradually. London just hosted its Olympic Games for the third time, most recently in 2012. Tokyo — another excellent choice on the part of the IOC — will host the 2020 Summer Games. Los Angeles is currently bidding to host the Summer Games for 2024. For these cities, the venues/facilities are already built. Maybe a little renovation or generally sprucing up might be in place, but such expenditures pale in comparison to building everything from scratch. Los Angeles, for example, has but one additional facility to build (for rowing and kayaking) and it’s all set. Think about it from the Winter Games perspective. Sure, a nearby, mountainous ski resort town can handle the alpine skiing events (Salt Lake had Park City, Vancouver had Whistler), but you still need to build a sliding sports track. That alone costs between $50-100 Million, and then there is the necessary ski jumping tower, etc., etc. Economically, it makes sense to host the Games in cities have already hosted them, and hosted them well. One could cycle the Winter Games from Salt Lake City to, say, Munich (they have a sliding sports track at nearby Koenigssee), then Calgary and/or Vancouver. What’s not to love? Similarly, a Summer Games cycle of Los Angeles, London, Sydney, Atlanta, Tokyo, and Munich/Berlin would work just fine. Seoul would be a viable cycle candidate as well. Either we start doing this, or we encourage cities to continue to engage in multi-billion-dollar boondoggles to build athletic venues that rarely get used again, like those in Athens (indeed, what shall become of Rio’s many facilities after these upcoming Games are concluded?). So, which is it going to be? Cycling the Games around to proven cities/countries, or more wasteful boondoggles? Does this look like a venue fit for Olympic sailing and swimming? Has the IOC learned its lesson yet (I’ll pause for laughter)? Frankly, I would not hold out hope for this. This is, after all, the same IOC that gave the Olympics to Nazi Germany in 1936 (both Winter and Summer Games). That awarded the 1980 Summer Games to Moscow, the epicenter of the slave society bent on taking over the entire world (I mean Communism, of course). They also awarded the 2008 Summer Olympics to Beijing despite the decades-long, grotesque train of human rights abuses on the part of Red China. Then there was the disaster that was Sochi in 2014. Leave aside the fact that Vladimir Putin has made every effort to cast himself in the mold of a Soviet Premier. Focus instead on the grossly inadequate lodging; the issues with the available food; the $51 Billion overall boondoggle of hosting the Games; the subtropical climate (keep in mind these were Winter Olympics); the putrid water supply; the state-sanctioned killing of stray dogs, and, not to mention, the state-sanctioned doping of the Russian athletes (no wonder Russia came out of nowhere to win so many medals after so many mediocre performances in recent Winter Games). Economically, the Brazil is in its worst recession since the 1930s, partly because of the declining oil prices on the world market. Locally, Rio de Janeiro has declared a financial state of emergency. Falling oil prices alone cannot be totally blamed for this crisis. Indeed, a much larger factor is government corruption, a hallmark of Third World politics. To that point, a major investigation into the state-controlled oil corporation Petrobas has already forced several government officials to step down. That is good, but will their replacements be reform-minded? The cynical side of me says, “don’t hold your breath.” Still, the political corruption scandals leading up to the Games have already had considerable fallout, for even Brazil’s president, Dilma Rousseff, faces impeachment. That may be good for justice, but not good timing for a country to have a political crisis when it is about to host something as mammoth as the Summer Olympic Games. As a side note, why does an oil company need to be state-controlled in the first place? The free market, coupled with sensible regulation, has proven to be an effective means of governing, say, Chevron and ExxonMobil. But this is what helps make the developed world the developed world. In any case, health-wise, things are no better. Yes, the tropics are lush and beautiful, with nice, sunny weather and gorgeous palm trees swaying to and fro. The bad news is that all that nice weather helps breed pathogens and vectors thereof that are non-existent in the non-tropical latitudes of the developed world. Yellow fever and malaria are two classic examples, but what has recently made news is the presence of the Zika virus in Brazil. Did the IOC consider this when they awarded the Games to a country that is A) tropical, and B), still mostly Third World? But that’s not the half of it. Another hallmark of Third World countries is a much greater degree of pollution than in the developed world. Outdoor aquatic venues for sailing and open water swimming are contaminated with trash and (drum roll, please) raw sewage. Let that sink in for a moment or two. Violence, of course, is another Third World problem (spare me the talk about developed world exceptions like Chicago and other inner cities where bad, warped values in those locales rule the day so as to provide Third World situations in an otherwise developed region). A human foot and other body parts have recently washed up on a beach at Rio. That’s bad enough. Worse is that this particular beach is the same venue slated for beach volleyball events. Speaking of violence, armed robberies on the street are up 24 percent. Some athletes who have already shown up in preparation for the Olympics have sadly experienced this first-hand. In May, an Olympic gold medalist from Spain and two other fellow member of their sailing team were robbed at gunpoint in Rio. More recently, the same thing happened to two Australian paralympians. Oh, and recently, a group of armed men stormed a hospital. This rise in violence coincides at the same time with city police resources in Rio being strained to the breaking point. They are so cash-poor that they have had to beg for basic office supplies and toilet paper. Because of the lack of resources brought on by Brazil’s economic crisis, the police have had to ground their helicopters and have had to park half of their fleet of cars to save fuel. Not what you want when hundreds of thousands of visitors, athletes and spectators alike, are about to count on police protection in that city. Some policemen in Rio have threatened to shirk their duties on account of their paychecks being delayed as well. The athletes themselves, many of whom have been gradually filing into the Olympic village in advance of the Games, have also borne the brunt of Rio’s many problems. The village, which consists of 31 17-storey towers, has been plagued with leaky pipes, exposed wires, and blocked toilets. Keep in mind that this is brand-new construction, not some dilapidated public housing tower. Gotta love those Third World construction standards. Already the Australian, Italian, and even Argentinian teams have rented hotels and/or apartments until the contractors can fix these issues. Anybody with a healthy dose of common sense would quickly point out that when you give something as huge and important as the Olympic Games to a Third World country, even one as borderline and emerging as Brazil, that issues like these are par for the course. So how did the IOC foolishly decide to let Rio de Janeiro host the Summer Games anyhow? Three possible reasons: One possibility is that the IOC is corrupt itself. How else does one surmise that it gave the Winter Games to Sochi? How else does one explain Russia not being entirely banned from these Olympics despite proven state-sanctioned doping at those Games? Over the past decade, one thing I have learned is to never underestimate the IOC’s susceptibility to bribes. The same thing could have happened in the Rio case. A second reason is that political correctness clearly played a part in tainting the IOC’s collective judgment. There is this politically correct mentality out there that every major city/major region deserves to host the Games. Giving the Olympics to a South American country for the first time ever helped the IOC solidify their PC bona fides and thus they felt very good about themselves in the process for being so “inclusive”. Third is that the International Olympic Committee was sold a bill of goods. Brazil’s economy was on the rise in 2009. Some observers at that time naively thought that Brazil’s economy would eventually surpass those of Britain and France. The folks from the Rio organizing committee played on that, as well as the sexiness of the city, along with the beauty of the geographical surroundings. Christine Brennan of USA Today, in an interview with Colin Cowherd on his FS1 radio and TV show The Herd, pointed out that this combination clearly played a factor when the IOC made their decision seven years ago. All that was before Brazil’s Third World hang-ups helped cause its economy to crash and is now behind those of Italy and even India. Solutions to avoiding issues like these in the future shall be explored in another article shortly come. But for the time being, the economic crisis, the political crisis, the construction and infrastructural issues, the rampant pollution and the rising crime add up to a train wreck-in-the-making for these upcoming Olympic Games. Maybe it will take such a disaster for the aristocratic-wannabes in Lausanne, Switzerland to finally wake up and use better judgment to avoid such disasters in the future. Posted by intellectualgridiron in Pop Culture, Sports. Tags: 2002, 2014, Aja Evans, America, American, Blues Brothers, bobsled, Bronze, Cab Calloway, crash, damage, Elana Meyes, In The Wee Small Hours of the Morning, Jamie Gruebel, Lauryn Williams, Minnie The Moocher, Olympics, run, Salt Lake, Silver, sled, Sochi, spare, training, U.S.A.
Elana Meyers and Lauryn Williams of the U.S.A. currently lead the field in women’s bobsled after two of four runs. The third and fourth runs will commence tomorrow (Wed., Feb. 19). But that is only part of the story. The other part of the story what happened to their sled during a training run. Reportedly, Williams pulled the brakes too late, causing the sled to crash into a wall, sustaining serious damage, as in, damage-too-serious-for-the-sled-to-be-serviceable-type of damage. One can see this damage in the photo below. 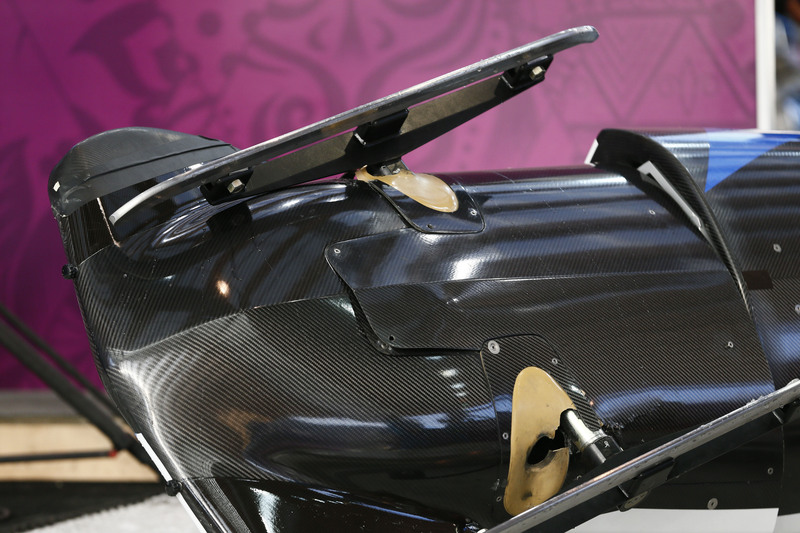 There is no way that a sled can be aerodynamically viable for Olympic competition after sustaining such damage! So, how do we explain Meyers’ and Williams’ two solid runs? Leave it to the support staff of the U.S. Bobsled Team to save the day. They went down to the USA House of the Olympic village, where they just so happened to have a spare sled on display. It also just so happens that they sneaked into the place to commandeer this spare sled with nobody noticing, because most people were glued to the thrilling hockey game between the United States and Russia — the same competitive game where the Americans ended up beating the Russians on the latter’s home ice in a shoot-out! This writer visualizes but one scenario when the folks at NBC reported how the U.S. Bobsled team staff managed to sneak in and smuggle out the sled: the “Minnie The Moocher” scene from “Blue Brothers”! All kidding aside, though, the team mechanics worked long into the night, end even “In[to] The Wee Small Hours of the Morning” to transfer key, undamaged parts from the broken sled to the spare, unblemished one. It obviously worked, given that these two ladies are poised to win the gold medal in their sport for Team USA, which would be the first time for this feat since the sport’s Olympic debut for women in 2002 at Salt Lake. Go Team USA! Epilogue, Feb. 19, 2014: Meyers and Williams ended up winning the Silver medal at these Winter Olympic Games at Sochi, while their teammates Jamie Gruebel and Aja Evans won the Bronze. Winning two out of three medals in Bobsled is always awesome! Moreover, Williams becomes one of the select few athletes to win both medals in the Summer and Winter Olympics. Indeed, one can count on a single hand how many athletes have achieved that rare feat. Go Team USA! The author with the United States bobsled team after they won the 4-man world championship at Lake Placid in 2012. I was so elated to have my picture taken with these fine fellows, my grin distorted my smile! 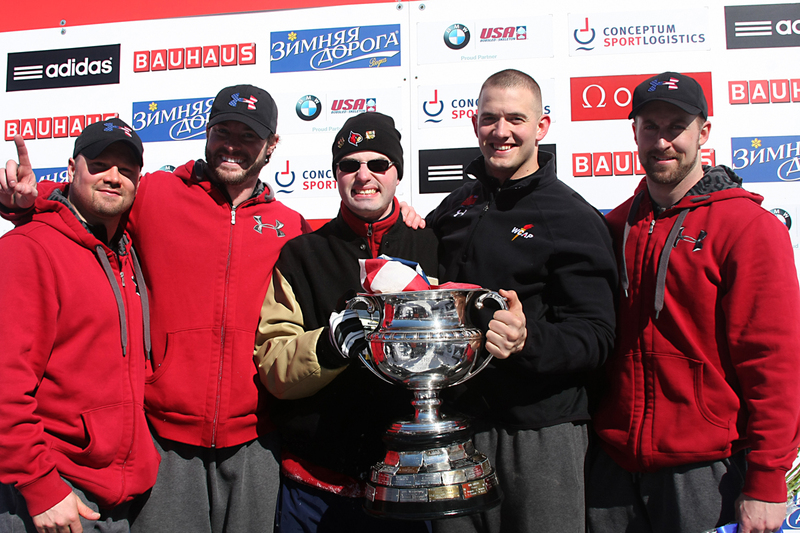 L-R: Steve Holcomb, Steve Langton, Patrick Murray, Justin Olsen, and Curt Tomasevicz. With a full week of the Winter Olympic Games at Sochi now in the books, it is finally time for my personal favorite winter sport to commence, that of bobsled (“bobsleigh” being the preferred international, i.e., non-American term). With recent success in the sport over the past 12 years, surely the bobsled events are to gather some decent attention here in the United States, and with good reason. We stand good chances of winning medals in all three events (2-man, women’s, and 4-man), but more importantly, we have great athletes who are also outstanding individuals representing the U.S.A. When I first started watching the Olympics in earnest as a youngster (Calgary 1988 to be exact), I’ll never forget the first time I saw a sled fly down the track on TV. I thought to myself, “Oh my, that was so cool! What is that?” Needless to say, I got hooked on bobsledding, and eagerly anticipated watching those events above all others during every Winter Olympics cycle. If you are a football and track & field guy like I am, this is the winter sport for you. It combines the strength, speed and power aspects of football and track, as well as the team coordination of football. Make no mistake about it; bobsledders are the biggest, fastest, strongest athletes in all of the Winter Olympic events. Don’t believe me? Just look at how Johnny Quinn (a pusher for USA-2) managed to escape being trapped inside a bathroom. Plus, it’s racing on ice, and in a country that enjoys auto racing as much as we do, that should seriously count for something as well. And yes, our 4-man sleds are built with NASCAR technology, which is why they’re the best! In any event, the Games in 1992, 1994, and 1998 all ticked by, and every time I watched in frustration as a medal in the sport continued to elude us. It therefore goes without saying that one of my favorite moments of the 2002 Winter Games at Salt Lake was witnessing on TV USA-2 break a 46-year* medal drought by winning a bronze medal in the 4-man event, only to be bolstered further by USA-1 winning the silver. America was “back” in the sport, and it felt great. The fact that women’s bobsled was introduced as an Olympic event that year, with America winning the gold, was the icing on the proverbial cake. Several years later, I started following the US bobsled team during the regular seasons (yes, there are such things in these relatively obscure Olympic sports), and started to learn the names of the fine fellows pushing and driving our American-designed and built sleds, courtesy of a project spearheaded by NASCAR driver Geoff Bodine. The 2008-2009 season particularly grabbed my attention, as I found ways to watch the races online, and pay close attention to the news of Team USA winning the 2009 World Championship, the first time America won such a distinction in literally 50 years (1959). The following year, we won the gold medal in the Vancouver Winter Games, the first time we achieved that since 1948 at St. Moritz. 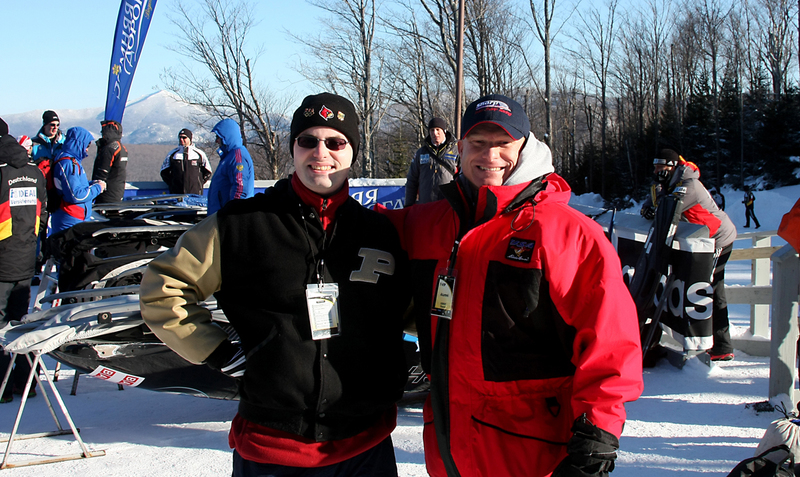 With my good friend and fellow Purdue Boilermaker Doug Sharp, who was part of the USA-2 4-man team that ended America’s 46-year medal drought in bobsled by winning the bronze at Salt Lake in 2002. Behind us is the “NightTrain” sled that our American boys used to win the gold medal at Vancouver in 2010. I had the blessed opportunity to travel up to Lake Placid, New York (as in, the holy grail of Winter Olympics in the Western Hemisphere) to photograph the 4-man world championships there in late Feb. of 2012 (photography being my main hobby these days). There, I met up with a friend of mine and fellow Purdue Boilermaker, Doug Sharp, who was on the USA-2 team that won bronze at Salt Lake in ’02. During the races, I managed to take some decent sports shots, despite my learning curve. In between the races, though, my friend Doug introduced me to a number of bobsledders, both past and present. After runs 1 and 2, for example, I was invited into the team garage — it was like being in the dugout with the Yankees! There, I was able to meet John Napier, a fine younger driver who was at the time the driver for USA-2. I also met Chris Fogt, who earned a spot on the USA-1 team at the start of this season. Moreover, I met both Adam Clark and Dallas Robinson, both from the Louisville, Ky., area (my native city and still current area of residence). Robinson, interestingly enough, is now the brakeman for USA-2 at Sochi, both 2-man and 4-man. During the VIP luncheon, I had the opportunity to thank a number of ladies and gentlemen for representing America so well with their accomplishments over the decade, but even after the part was over – several hours later – and the sun had already gone done, the day was not over yet. When we left the track that evening, Doug took me over to the Olympic Training Center, where, in a most unexpected turn of events, I was able to meet three of the four current men of Team NightTrain** (such is the nickname for the USA-1 crew; they dubbed their sled “The NightTrain” during the 2008-’09 season for its fearsome black color scheme). They were polishing their sled’s runners for runs three and four the next morning, and at this surprising opportunity, I once again was able to relay by heartfelt thanks for their efforts and for honoring our great nation in winning gold. USA-1 as they race down the track at Lake Placid, N.Y., during second of four runs, and en route to winning the 2012 4-Man Bobsled World Championship. Photo taken by the author. Meeting and befriending these fine fellows was truly a pleasure. Unlike the prominent athletes in major professional sports here in America (say, the NFL, MLB or NBA), these guys don’t get much attention for what they do. In countries like Germany, or especially Switzerland, bobsled drivers garner as much fame as quarterbacks do here in the NFL. How many people here in the States, who don’t follow the Olympics, know who Steve Holcomb is, let alone his push athlete teammates? In addition to meeting Holcomb that evening, I was also able to meet Justin Olsen, who was part of the team that won gold in Vancouver. Steve Langton took over for Steve Mesler after the latter retired, and the former is considered one of the finest push athletes in the world. Watch for Langton as the brakeman for Holcomb in the 2-man event. Nick Cunningham was also on hand to polish the runners for his sled. Watch for him as the driver for USA-2 in both the 2-man and 4-man events. They hail from all over this great land. Holcomb comes from Park City, Utah, and was originally an alpine skier before taking up bobsled (interestingly enough, the legendary Italian driver Eugenio Monti was first a skier before he himself took up bobsleigh). Nick Cunningham is from Monterey, Calif., home to one of the finest public aquariums in the world. Justin Olsen is from San Antonio, home of the Alamo and the beacon of liberty that it represents to Texans and many Americans elsewhere. Steve Langton is from the Boston area (and was a track star for Northeastern University). The brakeman for Team NightTrain, Curt Tomasevicz – who will reportedly retire at the conclusion of these Games – hails from a small town in Nebraska, and was a linebacker for the Cornhuskers before taking up this sport. Honestly, part of the fun of getting to know these guys was just talking to them about their native towns. Suffice it to say these guys did not get into the sport for the fame, for there is relatively little (that is, on this side of the Atlantic, at least). These guys compete for love of the sport and love of country. In fact, many of these men support themselves as part of the U.S. Army’s World Class Athlete Program, and have been, or still are, active in the National Guard. Chris Fogt even served a tour of duty in Iraq. But one thing that really struck me positively as I got to know these outstanding fellows is how much they appreciate their fans. Many prominent professional athletes seem to wall themselves off from the majority of fans – given all the crazies out there, one can surely sympathize – and hard-core fans to them are a turn-off (here’s a tip: want to ingratiate yourself to prominent professional athletes? Be a fan who has perspective). But to our American bobsledders, passionate fans are not a turn-off; in fact, they feed off their energy. For the record, the ladies who represent America in the women’s bobsled events are no less gracious or appreciative of their fans as well. Like their gentlemen counterparts, they are educated, industrious, dedicated, and down-to-earth. In other words, they are every bit the embodiment of how we would ideally envision an Olympic athlete to be. They, both the men and women, are also incredibly approachable. They put on no airs of being “above it all,” and are always glad to meet new fans and supporters. The fact that fans here in the States are relatively few and far between compared to the big money sports might be a factor in this, but that does not detract one iota from this positive trait. What is even more amazing about what these talented, dedicated men and women achieve is that they do so on a relative shoestring budget compared to prominent programs in other countries. Germany, Switzerland, and recently, Russia, lavish massive funds on their respective programs, albeit with mixed results. Germany is never to be counted out, and the Swiss have performed decently in the 2-man as of late, having to earn back their dominant spot that they kept throughout the 1980s and ‘90s. Russia is a constant threat to medal in the 4-man as well (Canada’s not too shabby either, fyi). But this season, Team USA has been in contention to win almost the entire time, winning enough races for USA-1 to win the overall World Cup trophy in the 2-man event and finish second overall in the 4-man (the latter alone is impressive when you consider the crash they had at Winterberg, Germany in early January). When one considers that these good fellows of ours achieve this with far less funding than other countries’ programs, it makes this momentous feat all the more incredible. In short, the dedicated men and women that make up the U.S. Bobsled Team embody everything that we as fans ought to admire in world-class athletes. You could not ask for more outstanding individuals representing the United States of America, and I for one cannot wait to cheer on my friends as they race down the ice at the Sanki Sliding Centre. Go Team USA! *Prior to 2002, the last time that the USA won a medal in bobsled was bronze in the 4-man event at the 1956 Winter Olympics in Cortina D’Ampezzo. Moreover, we have not won the gold in the 2-man event since 1936 (!) and have not medaled at all in it since 1952. That could very well change come Monday. **USA-1 won the 2009 World Championship, the gold medal in the 2010 Winter Olympics, and the 2012 World Championship (all in 4-man) using the NightTrain sled. Geoff Bodine’s “BoDyn” program soon designed a new sled for USA-1, which they immediately dubbed “NightTrain²”, and is the sled they have been using for the entire 2013-2014 season, the Sochi Games included. USA-2 has thus inherited the original “NightTrain,” so both sleds will be put to good use! Posted by intellectualgridiron in Politics, Sports. Does this look like a winter sports destination to you? Can one think of anything more antithetical to the Winter Olympics than palm trees? Yet this only scratches the surface regarding all the things wrong with Sochi, and it calls the collective judgment of the IOC into serious question. As a life-long fan of the Olympics, I must concede that I am very excited for the Winter Games to commence this Friday evening. But this time I am excited with reservations, namely on the very choice of the city and country to host these Games. It is painfully clear to me that the judgement of the leadership of the International Olympic Committee (henceforth the IOC) was, to put it mildly, severely compromised. What’s wrong with Sochi? Let us count the ways. Start with the fact that it is out-of-the-way. For the previous three Winter Olympics in a row (Salt Lake City, Torino, and Vancouver), the IOC got it mostly right. The United States and Canada are commerce-oriented, and have first-rate infrastructures, not to mention the population bases in the bookend cities dictate the size and quantity of hotel rooms to accommodate massive influxes of spectators for gigantic events, like, say, the Olympics. Torino was not a terrible choice in that they had a solid population base to handle the Games and the many myriads of people. It’s just that Italy is not exactly commerce-oriented, not when compared to the Anglosphere or even Germany, for that matter. Another huge problem with Sochi is the geography itself, and in more ways than one. 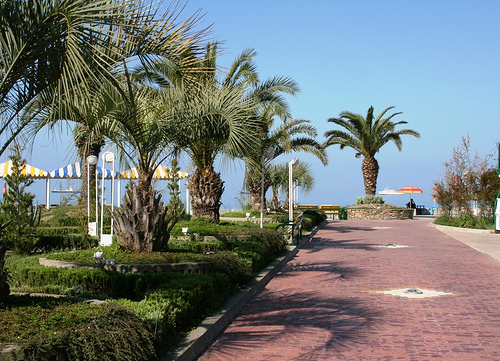 The most obvious problem is that fact that Sochi is a subtropical resort, hardly the ideal spot for the designated hub of winter sports championship events. At least the nearby mountains are snowy, though. The size of the town is not quite up to what is needed for the Winter Games of this modern size. Gone are the days when a tiny ski resort town like Lake Placid (population: less than 4,000) could handle the Winter Olympics. It was fine when you had only 19 countries competing, with a total of about 200 total athletes (as was the case in 1932), and they barely, just barely pulled it off in 1980. Calgary turned out to be a great choice in 1988, but then small town problems persisted again with Albertville (whose 1992 population was only about 35,000), and also with Nagano (1998: just too far out of the way), which brings us back to Sochi. At only about 340,000, it’s not as big as metro Salt Lake City, let alone Calgary, Torino or Vancouver. Isolation is another issue. It is located on the eastern end of the Black Sea, way too out-of-the-way compared to major population centers of countries with a sufficient degree of commerce-orientation. That isolation makes it unduly taxing on the kind of nations that will make the most substantial contributions athletically and in terms of medal counts. This does not even take into consideration the issue of sticker shock for families trying to make it to Sochi to cheer on their sons or daughters in person as they compete. Unlike commerce-oriented locales like Calgary, Salt Lake or Vancouver, which have plenty of hotel rooms all over their respective metro areas, Sochi has yet to build up the hotel space designed to handle the major crush of people about to descend on it. Combine high demand for hotel rooms and low supply thereof, and out-of-the-way air travel, and you have a prohibitively expensive combination that will keep the vast majority of families away, period. For those who do have hotel rooms, particularly those in the media, there are plenty of issues to contend with that are non-issues in more civilized parts of the world. The Russian government has had seven, count ’em, seven years to prepare for these games, yet look at the laundry list of issues that members of the media have to contend with regarding their lodging while covering these Games. There have been twitter-fed reports from journalists of having to climb out of their windows just to leave their hotels. Also, there are reports of hotel lobbies have no floors; of having to contend with stray dogs in hotels — you know, the stray dogs that the Russian government is not murdering with typical Bolshevik brutality. Then there is the glaring lack of water at some hotels, and where there is water, that people are advised not to drink it. Seven years and 51 Billion (with a ‘B’) dollars later, and this is the best they could do? Actually, why are we not surprised? This is, after all, Russia, whose people had to make multiple botched attempts to bump off Rasputin. Never underestimate the power of Russian incompetence — or corruption, for that matter. Remember, folks, one thing that separates the developed First World from every place else is a more open, transparent government, and relatively minimized corruption. It is clear that with $51 Billion wasted in Sochi, somebody got paid off. Now let us consider the not-so-small issue of athlete and spectator safety. Did the IOC consider Sochi’s close proximity to Chechnya and the fact that that spot of the world is a hotbed for Moslem terror? Or did that just slip the IOC’s collective mind as they awarded the hosting of the 2014 Winter Games to Vladimir Putin’s kleptocracy? The term ‘kleptocrat’ is not used lightly, either. During a formal reception, New England Patriots owner Robert Kraft happened to bump into Putin. The latter asked to see Kraft’s Super Bowl ring, and Kraft, ever the gentleman, obliged without hesitation in the interests of both classy conduct and international relations. If only Putin were as much of a gentleman. Instead of doing the right thing and returning the ring to Mr. Kraft, after the Pats’ owner so kindly handed over such a precious article of jewelry to the despot for his own close inspection and presumed admiration, Putin just put the ring in his suit pocket and immediately surrounded himself with three KGB agents before leaving the party without delay. This, ladies and gentlemen, is the leader of the nation that is about to host the Winter Olympics. I ask yet again: did the IOC consider that? Did they consider anything? If current hindsight is any indication, they did not. They did not consider the relative lack of commerce-orientation and the necessary infrastructure that it inevitably entails. They, apparently, did not consider basic geography, be it climate (remember, the whole subtropical resort deal), nor the human side of geography (Chechnya, Islamic terrorism, etc.) and its obvious security risks that imperil athletes and spectators alike. Neither did the IOC consider geography in terms of fundamental location, and the fact that it is out-of-the-way compared to many other sites in more civilized locales. Need we mention the IOC’s lack of consideration regarding the human rights violations and the increased authoritarianism of Putin’s regime? This is to say nothing of the rampant corruption that has left everybody outside of the teams themselves lacking for basic living necessities in their lodging. There are really only a small handful of countries that are capable of competently handling the Olympics, given the size to which the Games have grown. And remember, the words ‘competence’ and ‘Russia’ hardly go together! Again, the importance of the commerce-orientation in a country is that it has the infrastructure (transportation, hotel accommodations, sanitation/cleanliness, etc.) that can handle such an astronomically massive set of events. But moreover, this same small handful of governments that are sufficiently free/democratic, and have a free press that can call wayward politicians and government officials into proper account (barring left-wing media malpractice, anyway). Such openness is a symptom of the proper commitment towards first-world living standards and infrastructure in the first place. The United States, Canada, Great Britain, Germany, Australia and Japan — to an extent — can all pull it off well. Why roll the dice with some place so isolated, in a dangerous part of the world, with a non-winter sports climate, in a country with an increasingly dictatorial government? Of course, one plausible explanation for this gross lack of judgment on the part of the IOC is that maybe part the $51 Billion spent on these Games in Russia was dangled in front of the faces of key IOC members to cast the vote in favor of Putin’s regime. This is Europe, after all, where such corruption is more commonplace than in the Anglosphere, by and large. The truth of the matter is, as mentioned before, the vast majority of countries are not built to handle the Olympics. Contrary to the feel-good, politically-correct mantra, not everybody deserves a chance to host something so huge. Not all cultures are equal, hence not all countries are properly equipped to handle such a massive undertaking. The wise approach would be to cycle the Games around in a handful of cities/countries that have proven that they can handle such events without a hitch. Why not cycle it from Salt Lake to Munich to Vancouver (or Calgary) and repeat the cycle? Don’t out-think the room, IOC.